I would love it if this became a regular series. I think we have different ideas of what is a painful price for a shirt. I would most definitely pick up the F21 top, though. 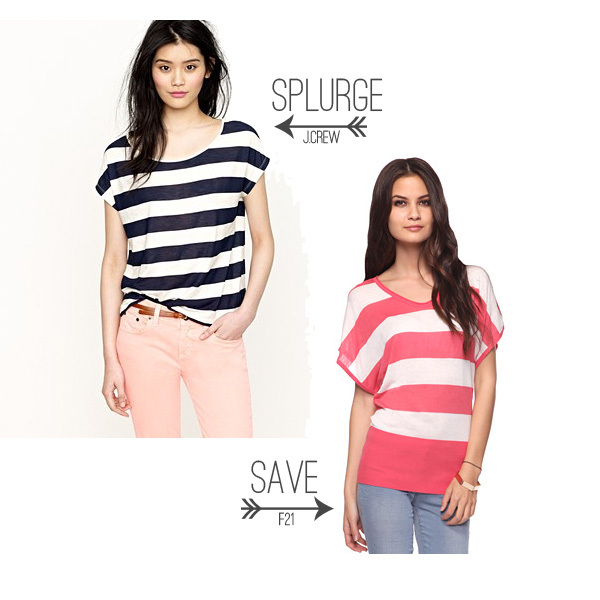 I've been obsessing over striped slouchy shirts lately. I've gotten a few this winter on Gaps's clearance rack! I LOVE them. And I have to say I kinda like F21 over the JCrew version!! Maybe it's the wide band at the bottom?! Super cute find Kayla!! Agreed, this would be a good series, I love a steal! I'd have a hard time spending $40 on a top too. especially one I don't need. LOVE the one from forever 21! Doesn't $39 seem ridiculously cheap for J.Crew? I think I would try to find a cheaper cotton option because the knit will pill.